Do you remember back a number of years now when the US Postal Service launched a new advertising campaign for their Priority Mail service? The campaign’s tagline was simple and direct: What’s Your Priority? 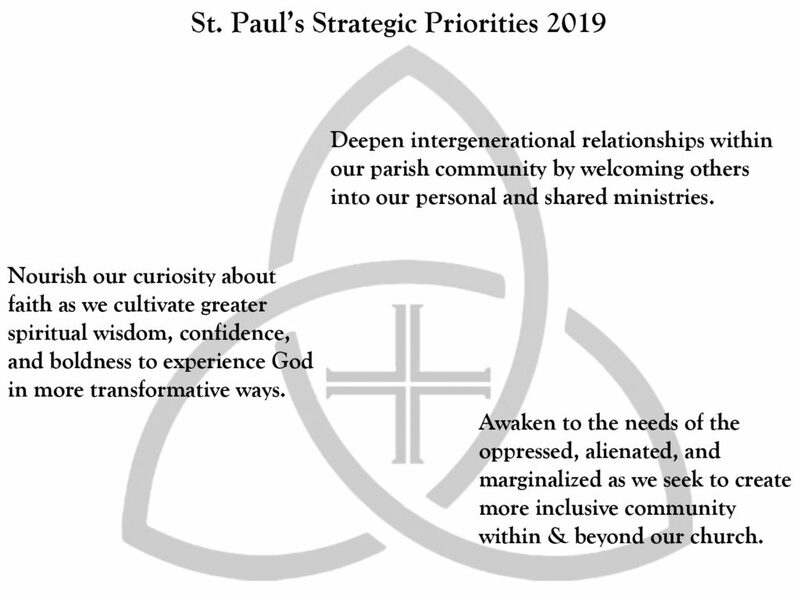 As you heard on Annual Meeting Sunday, with the help of every one of you who attended a focus group or filled out a survey (and the tireless efforts of the Strategic Planning Committee), the Vestry has recently finished its discernment process and identified three high-level Strategic Priorities for St. Paul’s. The Vestry has taken the data that the Strategic Planning Committee collected, collated, and analyzed – data that communicated what each of YOUR individual priorities are – and distilled them into language that describes what OUR priorities are as a community. Their process was grounded both in analysis and also in prayerfulness, listening with one ear to the congregation’s collective input about their hopes for the future of St. Paul’s, and with a second ear to where God is beckoning us next in our continuing journey as God’s church. The resulting Strategic Priorities are a response to what they heard using both ears – ideally encapsulating all of your input as well as their sense of what the Holy Spirit was trying to say to our church as well. The intention is that while every part of each priority might not fully resonate with every person, at least some aspect of at least one of the priorities will touch a deeper, God-given yearning within each of us. Just before Advent, the Vestry shared a draft of these priorities at our late-fall ministry leaders gathering, and was affirmed that everyone present could name something in the priorities that spoke to them at the heart level. Our Vestry has chosen to adopt “priorities” that they expect, with your help and God’s, will infuse every ministry, team, committee, and activity of our parish in the coming months. This differs somewhat from the way a Board of Directors of a company or non-profit might impose a strategic plan with specific action steps, defined time horizons, and measurable goals. Rather than such a top-down approach, the Vestry hopes that each ministry group in the church will spend time this winter and spring reflecting on how our priorities as a church might shape (or re-shape) their ministries. The Vestry has already begun this work for themselves, and they stand ready to provide support, advice and accountability to each ministry as they do so, too. Along with them, Rev. Rachel and I both commend our new strategic priorities to you and look forward to seeing how they help all of us respond to God’s beckoning call to be friends of Jesus in our own place and time.